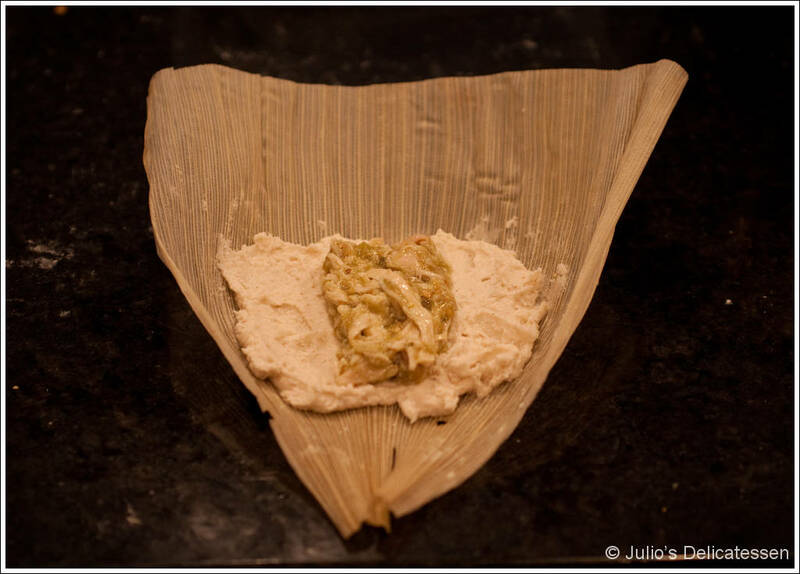 Click here for a PDF of the recipe for Green Chile Chicken Tamales. 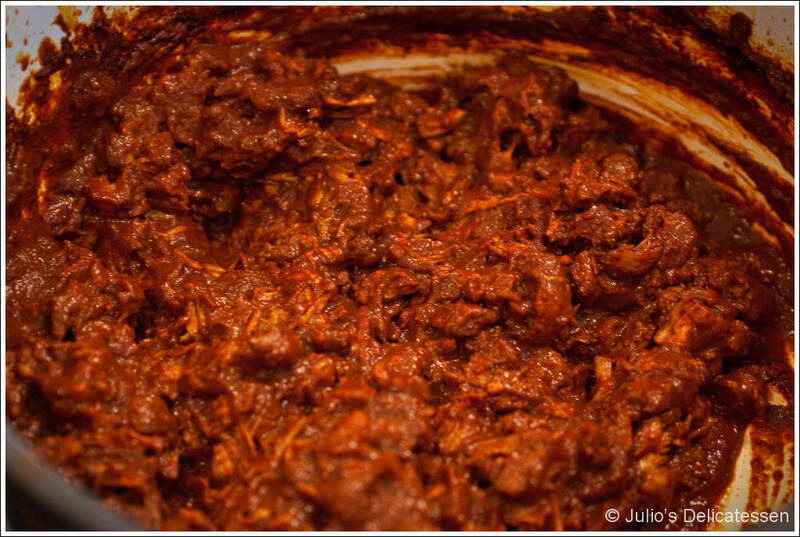 Click here for a PDF of the recipe for Red Chile Pork Tamales. This weekend, I wanted to make a big batch of tamales to entertain a large group (and as an excuse to use the new tamalera I just bought). 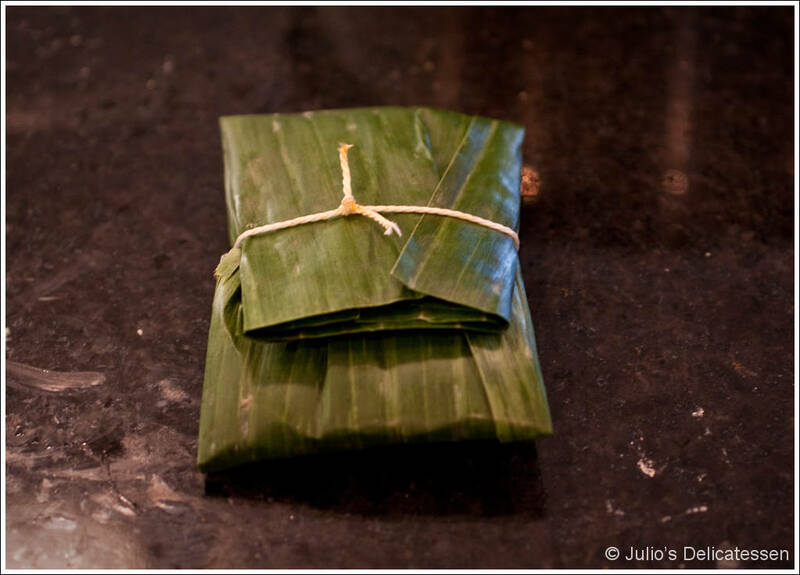 There are two common wrappers for tamales – dried corn husks and banana leaves. Since I was making two different varieties, I used both types of wrapper to make it easy to distinguish between them. 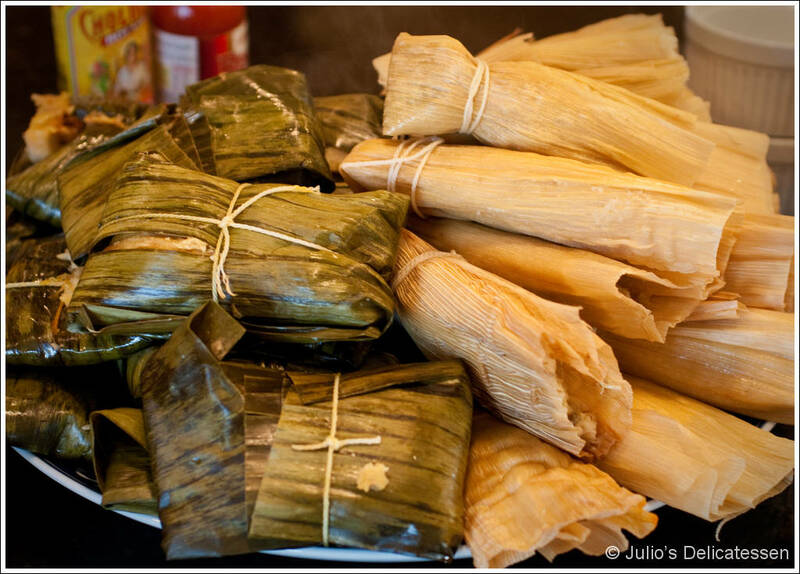 A huge pot of steamed tamales – along with a big pot of borracho beans (or charro beans) and some rice – what could be better? Prepare the corn husks – cover the husks with hot water, placing a plate on top to keep them submerged. Let stand for a couple of hours. When ready to form the tamales, select some of the largest. Pat dry with a towel. 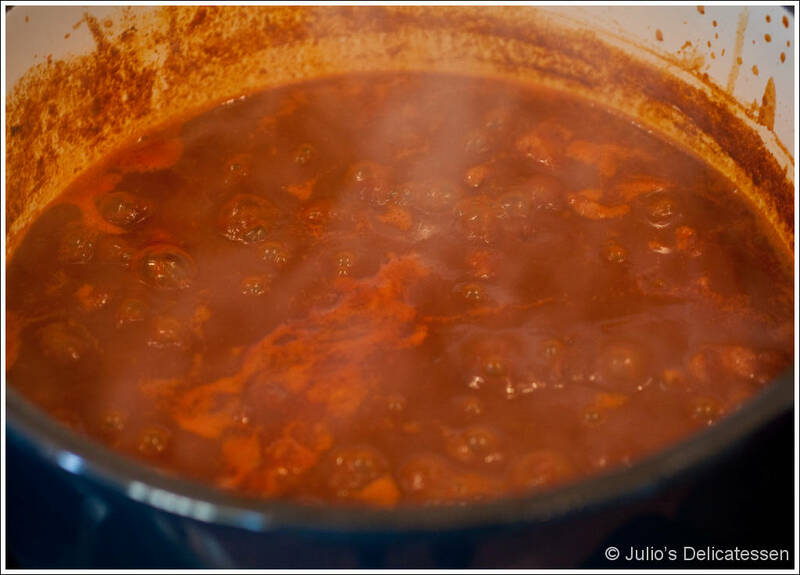 Prepare the red chile pork filling – Add the chiles, garlic, pepper, cumin, and 3 cups water to a food processor and blend until smooth. Strain the mixture into a pan. Add the meat, 3 cups water, and 1 tsp salt. 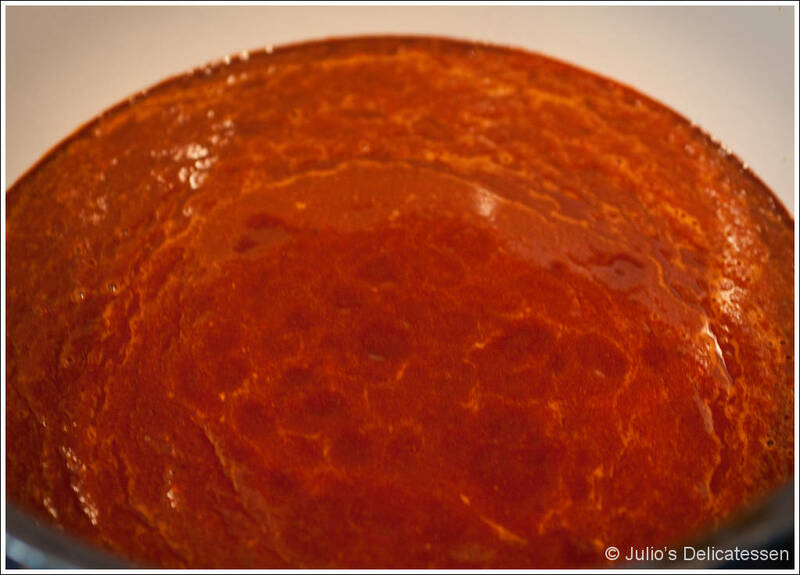 Bring to a simmer and simmer – uncovered – for about 1 hour. Allow to cool to room temperature. Use a fork to shred the pork in the sauce. Add salt if necessary. 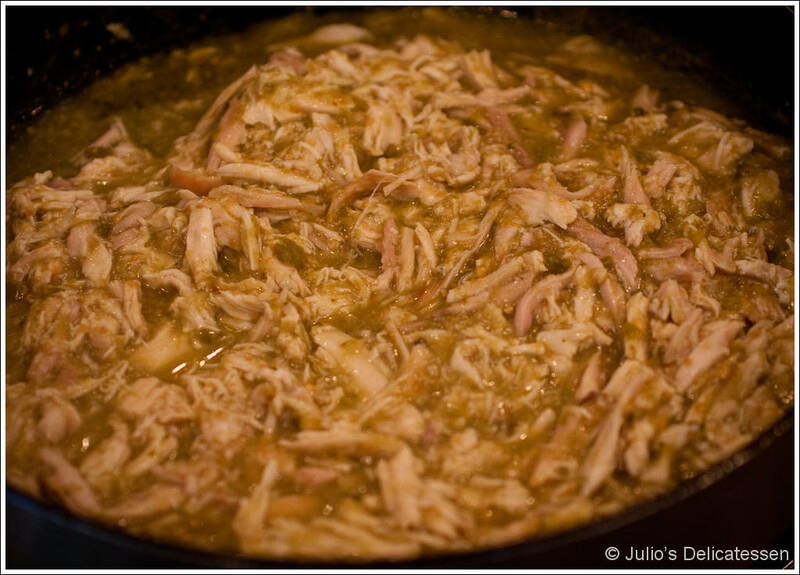 Prepare the green chile chicken filling – roast the tomatillos on a baking sheet under a hot broiler until soft, roughly 5 – 6 minutes per side. Cool, then scrape into a food processor along with any juice that has collected on the baking sheet. Add the chiles and garlic and process into a smooth puree. 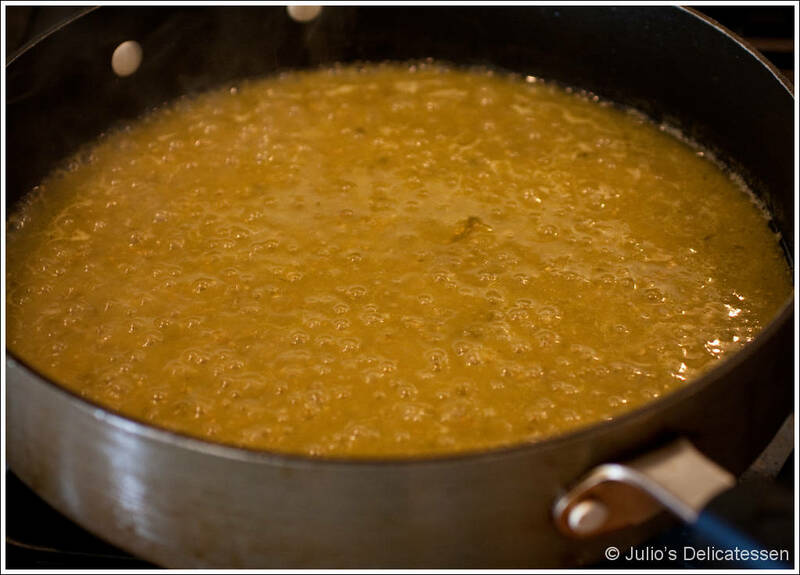 In a saucepan, heat the oil, then add the puree. Cook until slightly thicker and darker, about 5 minutes. Add 2 cups of broth and bring to a simmer. Allow to simmer for about 10 minutes. Add salt, chicken, and cilantro. Cool to room temperature before proceeding. Prepare the batter (one batch – enough for 24 tamales) – using an electric mixer, beat the lard with 2 tsp of salt and the baking powder for about 1 minute. Continue mixing while adding the masa harina (in three separate batches). Reduce the speed of the mixer to medium-low and add the broth. Continue beating for another minute or two. Beat in the remaining ½ cup of broth. Refrigerate the batter for an hour, then rebeat (adding a little more broth to achieve the same consistency as before refrigerating). 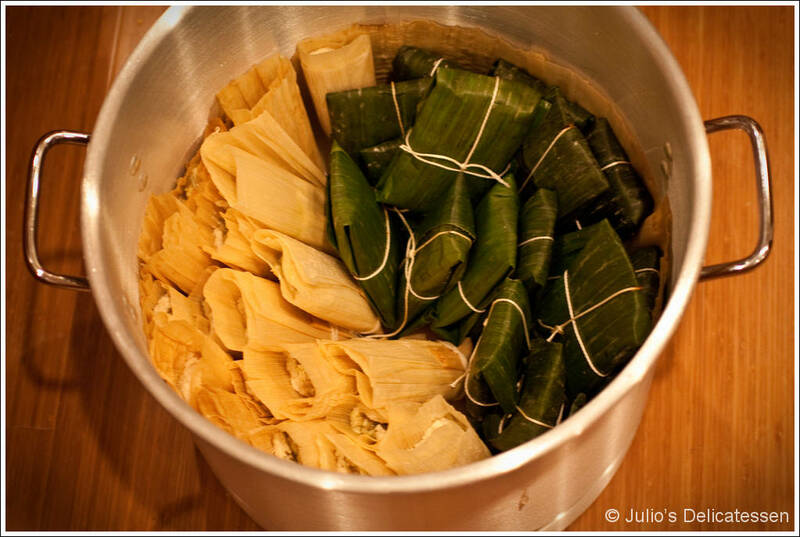 Form the tamales – cut 48 pieces of string (or long pieces of corn husk) and prepare 24 large corn husks. One at a time, lay a husk on the work surface with the tapered end pointing toward you. Spread ¼ cup of the batter into a 4 inch square, leaving 1.5 inches of border at the bottom and at least 1 inch on each side. Add 1.5 Tb of the filling in a line down the center of the batter. Use your hands to pull the two sides together, causing the batter to completely surround the filling. Fold the bottom up but leave the top open. 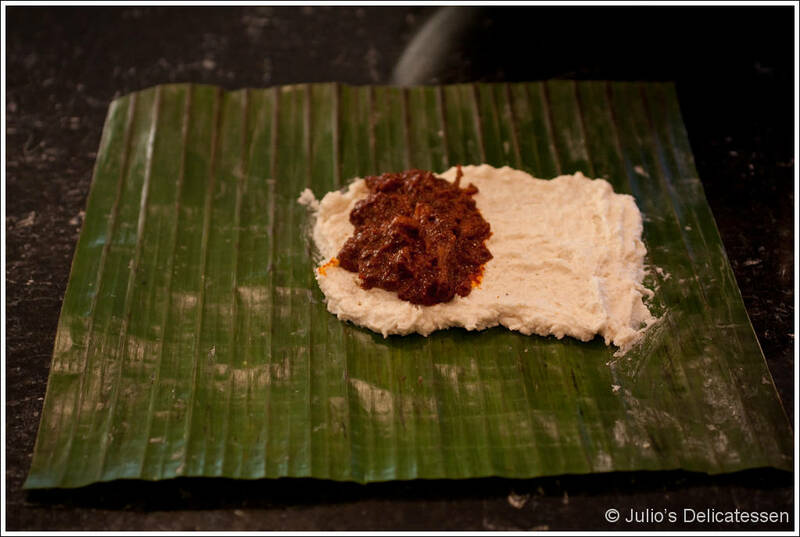 Use a string to tie the tamal closed. Prepare a steamer – Add water to the base of a steamer. Add the rack, then line the rack with corn husks or banana leaves, leaving spaces between so water can drain. Add all of the tamales loosely, with the open tops pointed upward. 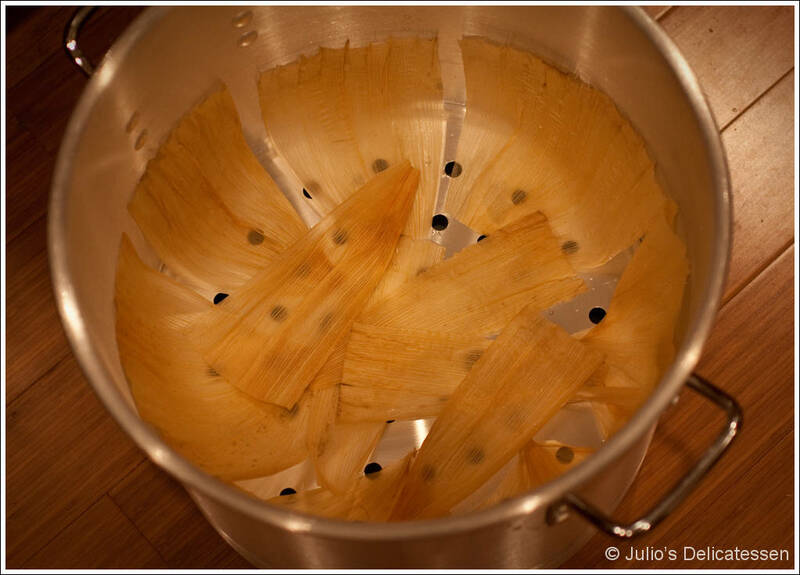 Cover the tamales with more leftover corn husks, then put the lid tightly on the steamer. Steam over medium heat for about 75 minutes, adding more boiling water if needed. 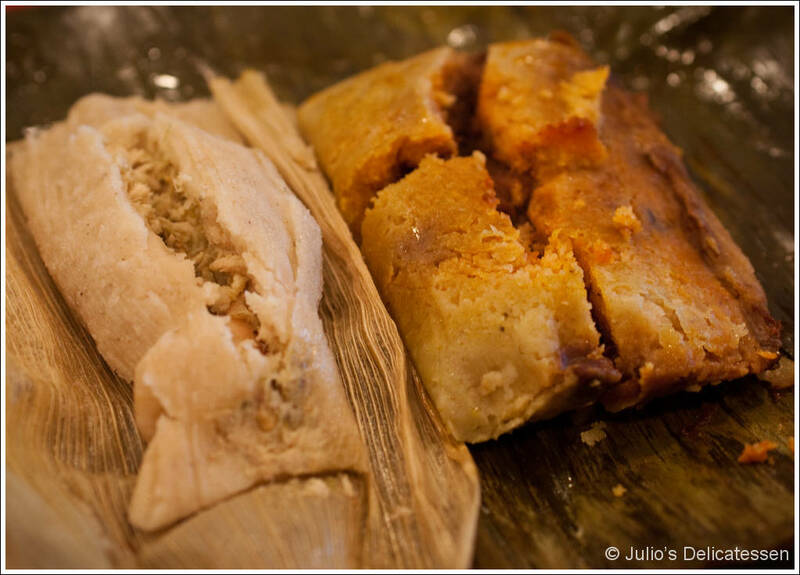 The tamales are finished when the husk easily peels away from the masa.